Perfect for the bedroom. Feels great under our feet. Perfectly styled to energize today's urban-chic contemporary decor, this 2'2 x 6' rug from Safavieh's Vision Collection is a beautiful addition to any home. Its cream color enhances the sleek streamlined look and blends effortlessly with neutral color palettes. This rug looks better in person then in the picture. I use it as a running in my hall way. I have received many compliments on it. The color literally goes with everything. It’s a good quality and I recommend buying the non slip pad for underneath the rug. It doesn’t show dirt due to the mixture of colors. I highly recommend this product! Nice thick, soft rug. Color is just like picture (I got the cream with tan tones), but if you're going to put it on a hardwood or uncarpeted surface you NEED a rug pad otherwise you'll be slipping all over the place. Otherwise, very happy with this rug! This rug is very soft on the feet. I love the tonal pattern which gives it a nice color pattern at different angles. Great value and quality. Beautiful Runner!!! Perfect color combination. Looks great in my kitchen! Feels great too in my bare feet ! The colors were the same as shown in the picture. I would recommend this rug. 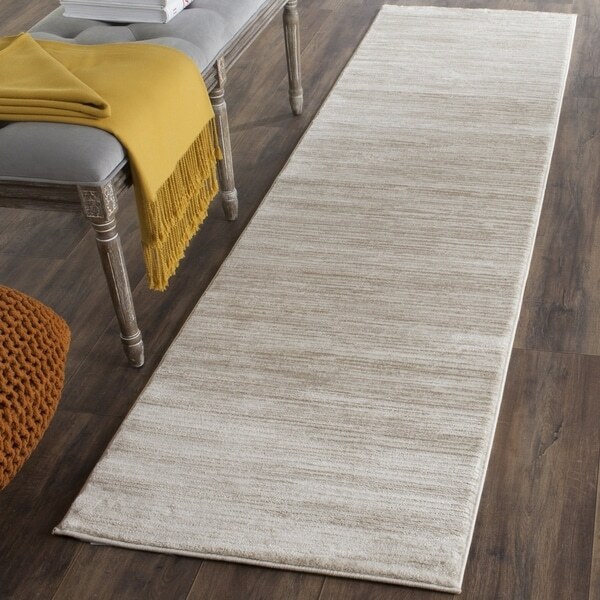 Very happy with the Safavieh Vision Contemporary Tonal Cream Runner Rug. Good quality and looks very nice in my family room. Good quality rug! Love the color - it blends in nicely with my current color scheme! Very nice rugs they look good and feel good to walk on. They are not to plush but are not thin either. The color is great they are two toned cream and a slight light brown some times light gold striped (depending on the light in the room) the rug does not look striped because the stripes are soft and depending on the carpet pile and where you step (it appears either cream color or light brownish gold. Nice rug worth the cost. 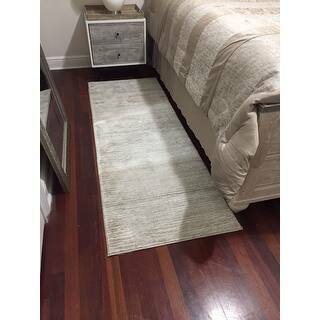 Awwwww yes this is a very nice ivory/light grey long carpet that fits perfect on the side of the bed. Very nice quality and color that bring out the walls and bedroom decor. I would definitely recommend this for anyone who wants to add a nice carpet to their living room as a long runner rug or anywhere where they see fit. I definitely like the color and quality and most of all the price. Arrived as expected and size is correct. Nice rug but Color is not as expected - more brown than cream. Did not match other rugs I have. I'm not returning it since shipping is more than the rug cost! Love the different cream colors! Soft and warm. Perfect color runner, feels and looks great. Arrived quickly, great quality. I love this rug. Good quality for the price. Somewhat thin but creates easy when vacuuming. the colors match my guest room perfectly. I did purchase another runner to use as a backup. I would recommend this purchase. 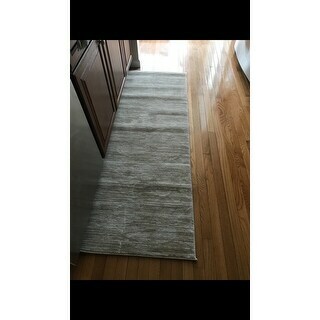 Bought both the large area rug and hallway runner.....love this rug! Lots of pinkish undertones in this rug, so much so, that it doesn't quite work in the space where I wanted to use it. The colors look more muted online. Other than that, it's very soft and probably won't require a rug pad. I will probably have to return it, but it might not be worth it, since the return shipping is almost half the cost of the rug. When I saw the sale for two rugs, I couldn’t buy help but buy them. They are great for bed side rugs with those old wood floors. They are very high quality and accent the bedroom perfectly. I have to say this site is awesome for finding those hard to find things that other sites charge way more for. To compliment my living room rug in front of our couch. "How long is 2'X6' in inches/ Ft?"